Cannot even express how delicious this is - almost too good to be true! 1. 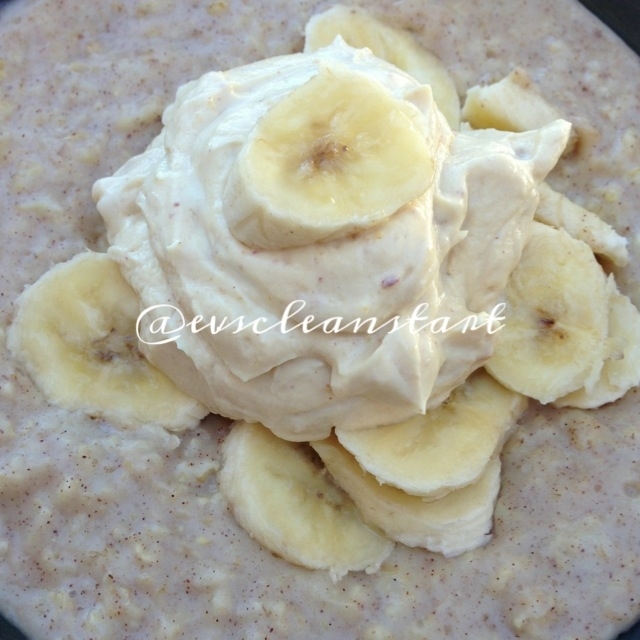 Combine 1/3 cup quick oats with 2/3 cup water and microwave for 1 min. 2. Stir in 3 tbsp egg whites, then microwave another minute. 3. Stir in 1/2 tsp cinnamon, 1/2 tsp natural vanilla extract, and 3 drops stevia. 4. Top with sliced banana and yogurt mixture made with 2 tbsp non-fat greek yogurt, 1/2 tbsp crunchy natural peanut butter, and 2 drops stevia.